Have you ever been haunted by an image? Have you ever seen or heard something that stuck with you to the point of moving you to action? Perhaps images of the aftermath from a natural disaster. And you knew you needed to donate to relief organizations. Or, for my generation, perhaps images of the twin towers falling that still seem surreal and make your stomach churn. I've seen such images. About eighteen months ago, I began to see images and read information about a former colleague's efforts through a non-profit that she founded. I was intrigued. She has five children. She is one busy mama. Yet, she still finds time to do something. To make a difference. I saw that she was traveling to Africa and she had founded an organization designed to fund locally run efforts to feed, cloth, and educate orphaned and vulnerable children. It was the flip side of the entirety of my career. Here, in comfortable America, I sit on the pretty couches of middle to upper class families and help them through the process to become adoptive parents. She was going to the dirty and barren places to make a difference in the lives of orphaned children who had nothing. 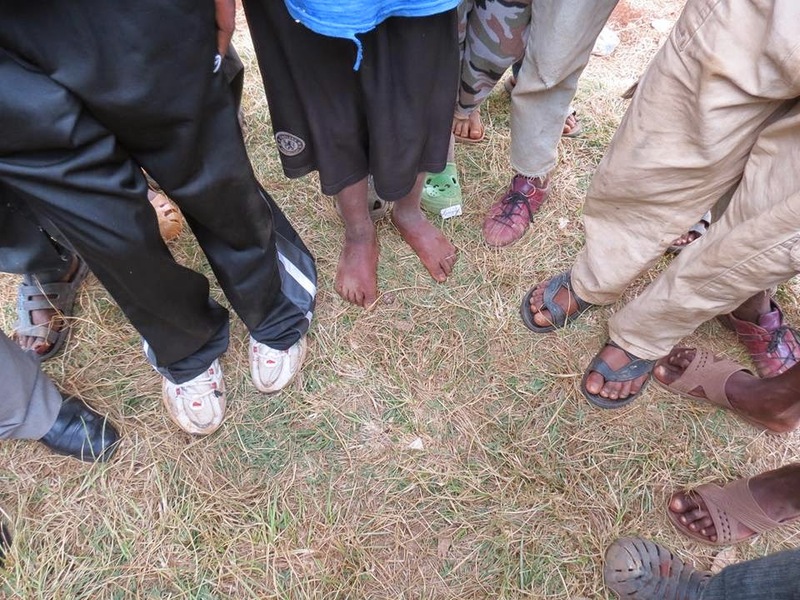 Children in rags and shoeless. Children with no family, no hope, no future. Unless she dared to enter their hard lives. And it screamed at me. It yelled for my attention to move past my tunnel vision. How I had spent 20 years working in adoption but had never really opened my eyes to the plight of children who would never be adopted. I've seen dozens of referral pictures. Still photos of children who will soon be adopted. And yes, they are sad. Some have been hard to see. But they have always been only filtered images. Watching my friend's efforts was like the camera was pulled out to a wide angle and it was playing a video that showed the full story. I had been doing some reading and praying, and it made me consider the short sightedness of a faith lived in the comfort of my holy huddle. Here in my safe suburban life, with my pretty clothes and lovely house and beautiful neighborhood and a great education readily available for my children. And I had never paused long enough to see how very rich I am. How very wealthy we are in America. In our safe little bubble where we can easily ignore the plight of the rest of the world. But my friend's efforts were the final wake up call. So I wondered what to do with it. When you consider the millions of children worldwide who are counted as orphans, what on earth could I contribute to make a difference? Yet her non-profit is called One Together, Inc. Her vision is that one person at a time can touch one life and create a ripple effect. She sees the millions, but focuses on one at a time. She is moved to action for one, instead of sitting idly by, unmoved, because of the millions. One at a time, uniting efforts together with one other person willing to make a difference. So I prayed some more. What impact could I possibly make? Then, it dawned on me. I need not reinvent the wheel. Just as she does not. But she throws her weight behind organizations already doing great work. And I could throw my weight behind her to increase the momentum. I had attended a little clothes swap with some friends and it was just about the funnest thing ever. It spoke to me on so many levels. I got to clean out my closet, get together with friends, and shop for some "new-to-me" things. Talk about bargain shopping! It was also an answer to consumerism because it was a fun way to recycle, basically. That's how it came together for me. The idea of doing a clothes swap on a community level. Blowing the idea up bigger, on a broader level, and charging a registration fee as a way to raise money. To raise the funds to help children who are vulnerable and orphaned. Maybe I can't jump on a plane to Africa, but I can use my organization and planning skills and creativity to create not just an event, but an experience. From the very beginning idea of Swap & Shop, I've wanted it to be much more than a fun event. I've wanted participants to enjoy purging and shopping for only a one-time $20 fee. But, I also want them to walk away getting it. Getting the problem and the pain and the suffering of children whom they may never meet. But whose lives they can change. So, my friend sent me pictures from her latest trip to Ethiopia. I wanted to blow them up into huge posters to tell the story. To paint the picture of the lives these children endure, day in and day out. It's hard to describe how I felt during that long telephone conversation when she walked me through their stories, one photo at a time. It was profound. I felt as though I was finally understanding. I was finally seeing the other side of the equation, away from the sterile environment of adoption where I have worked. My eyes were open to the existence and struggles of children with no parents, or with parents who cannot raise them. To kids who live on the street or in a dump or in a government orphanage that is barely a step above other options. These are the children whose photos I will never see as a referral for a waiting adoptive family. These are the children who will never be adopted. And, they make up the majority of children worldwide who fall into that orphan category. The inhumanity of it. 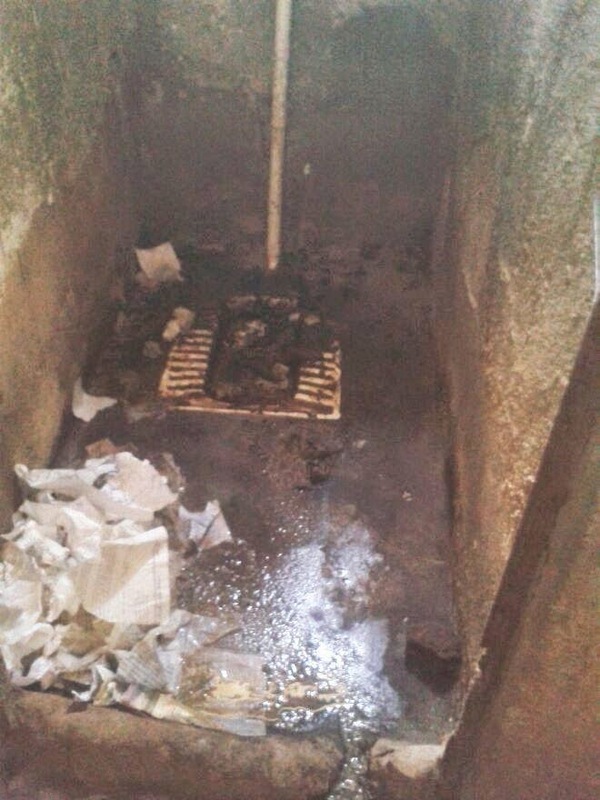 This is the only "working" bathroom at a government orphanage for over 200 boys. I cannot imagine the smell of it. Or how it makes the children feel. That this is the facility set aside for them. Bathing is splashing water from the sink over their hair and bodies. I can't even fathom how the boys manage with other bathroom needs. And it has been in this state for years. What message does a young orphan boy receive about his worth and his future when THIS is the "best" that his government can offer for his day to day care? This is a group of boys from that orphanage. I want you to look at the barefeet of the boy in the black shorts and tattered blue shirt. That boy was 8 years old when this picture was taken. He had just come to the government orphanage. He'd just arrived. With the tattered clothes on his back and his bare feet. And that is all he will have. Whatever he showed up with and whatever he can scavenge to find. The lucky ones find a way to get shoes. They are on their own as far as clothing goes. By whatever means they can obtain basic items such as shoes and clothing and a pillow...that is their only option. He is 8 years old. And he is all alone in the world. Yet the photos of his face still show a broad smile. I know of no greater definition of hope. 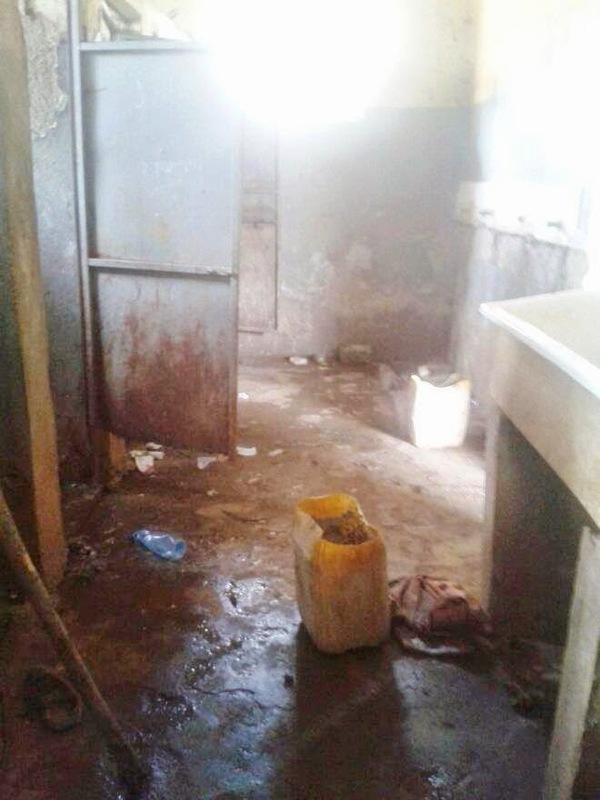 This is the "kitchen" of that government orphanage. 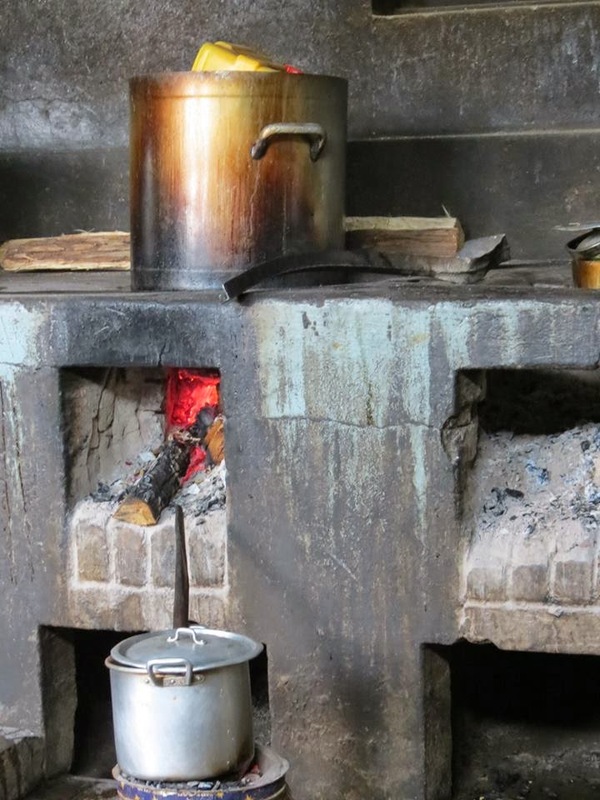 Where a beautiful Ethiopian woman cooks one meal a day for all 200+ boys. They are served one meal daily. No utensils or cups given, lest disease and sickness be spread. It is generally a meal of rice and a roll, or something along those lines. May I never complain about my own kitchen and my desire for remodeling or upgrading my own 20 year old oven. Remember. These are the lucky ones who live at the orphanage until they age out. The ones who live here are not so lucky. This is a house. In a local dump. Where 30,000 people live. Amongst the filth and rubbish. And their existence is even bleaker. Their lives are even harder. Here is the sad reality. I believe with great conviction that an entire generation of children around the globe are being left to this kind of fate. The statistics of the 140 million orphans... this is their life. Some are not actual, true orphans. Their parents just cannot care for them. Or the cycles of abuse and dysfuntion that carry from one generation to the next means that the children need to live elsewhere. Let me say it clearly. An entire generation of children around the world will be raised in a filthy or barren institution with limited resources. Or on the streets, raising themselves, or in dumps, or some other horrific circumstance. Y'all, we can do better than that. Lest you feel frozen to make a difference, let me assure you. It takes so very little. 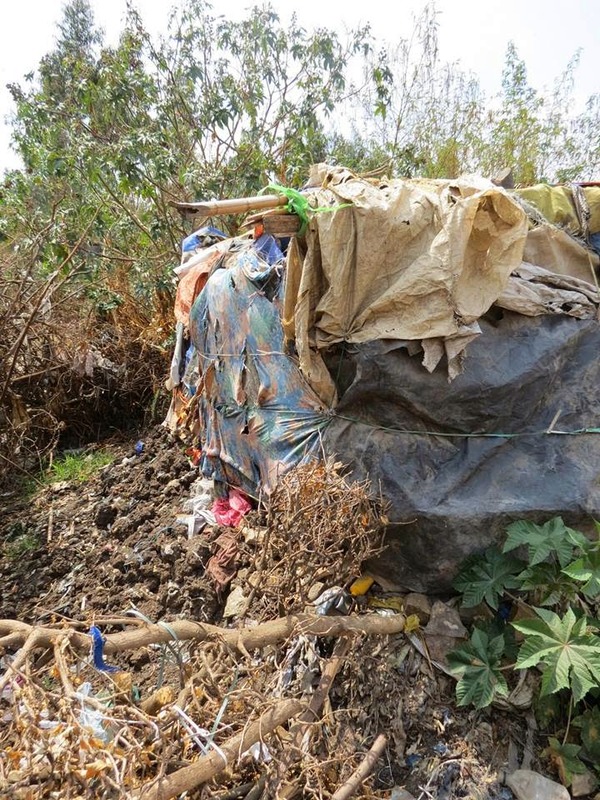 For $50 a month, a street child or a child living in these awful government orphanages can be placed in a private group home, with loving house parents. A clean environment where they are fed, clothed, and educated. For only $50 a month. In some of the feeding centers, it takes as little as $13 a month to feed and educate a child. That's about two venti lattes. That is the WHY of Swap & Shop. So WHAT is Swap & Shop? It's a community clothes swap and here's how it works. You clean your closet of gently used ladies and junior girls clothes, jewelry, shoes and accessories. You pay a $20 registration fee to participate. Then you can shop for as many items as you donated. That's it. It's that simple. This Saturday morning, at Kidztown at 3000 William D. Tate, in Grapevine, Texas, from 8 - 11 am, you can bring your donated items and entry fee. OR, you can contact me and donate your items during this week. Then go grab lunch or run an errand. Come back between 12 - 5 pm, and shop away. I don't know of a better bargain. That makes a bigger impact. There will also be a silent auction and items to purchase and a board of one-time needs that you can cover for the various feeding centers and organizations that One Together, Inc funds. These needs are things such as toothbrushes or backpacks, and their one-time cost starts as low as $20. The WHY of Swap & Shop is the beautiful children. Children you may never meet but whose life you can literally change. 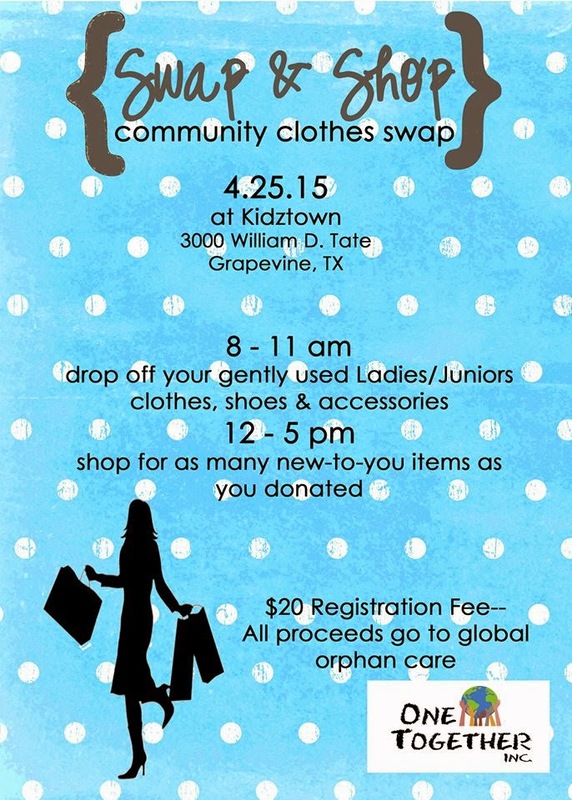 The WHAT of Swap & Shop is a fun clothes swap on a community level for a one-time low fee of $20. That's all it takes to be a world changer. So, think about it. Don't miss it. I am passionate about rallying the troops here in our safe little surburban lives so that we can change the world for vulnerable children around the world. I know of no better way to pass a Saturday. Where Do I Get Off the Crazy Train?